Fab Bag of October comes in a beautiful gold clutch kind of bag(If it could have been stiffer, I could have loved it more). The bag goes well with ethnic wear. To know the details about Fab bag, read this post. 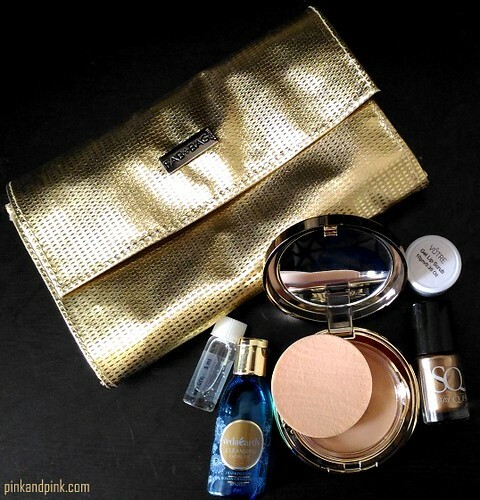 This month's fab bag is obviously a steal as I had the option to choose C.A.L Finish up compact. The Stay Quirky Nail Polish is nail polish worth owning. October Fab Bag 2016 - What's inside ? Received full size C.A.L Finish Up Compact - C02 - Full size price is Rs.650 for 12g. Received full-size Stay Quirky Nail Polish - 04 6 ml worth Rs.165. The packaging of this product is really nice. It looks amazing in the golden color pack. It is quite easy to apply and gives even finish. It helps to leave the skin looking naturally flawless. Almost all the ingredients are chemical like other compact powders. The shade is really beautiful. It gives a glossy look and finding it as a chip free one. The company claims it as a healthy Nail Polish, free from hazardous Toxins. Not tested on Animals and no Animal Ingredient used, a vegetarian and Vegan Product. I am quite happy with this nail polish. It is truly my shade. The bottle is really cute. The brand claims this oil as a blend of aromatherapy and Ayurveda. The product is made with ingredients that help rejuvenate the skin, improve blood circulation and make the skin soft and glowing. It is actually a proprietary medicine. Just a few drops daily can help you to remove impurities from your skin. Each 100ml contains oil of Apricot Kernel 49.17ml, Grape Seed 48ml, Palmarosa Leaf 0.53ml, Frankincense Oleo gum Resin 0.53ml, BenzoinResin 0.40 ml, Saffron (Crocus sativus) Stigma 0.20ml, Roman chamomileFlowers 0.17ml. Also, contains Vitamin E and Soya Lecithin to Q.S. Caution - Not for children and the pregnant woman. The product has a very good list of ingredients like Jojoba oil, Wheatgerm oil, Licorice, Lemon and corn particles. I am sure that it is certainly one of the best lip scrubs. The downside of this lip scrub is the smell. The serum comes with a potent lightening complex derived from Ferulic Acid and Waltheria indica extracts which are known to even the skin tone, lighten the freckles and age spots, reduce hyper-pigmented areas. Kaya claims that the serum gives you a flawless, healthy, luminous, clear, blemish-free and even tone complexion. C.A.L Finish up compact and Stay quirky nail polish justifies the price you pay for this month's fab bag. In fact, that's a steal! Votre gel lip scrub, Vedaearth cleansing facial oil and Kaya brightening serum are icing on the cake. The bag looks beautiful but should have been a stiff one. Go and grab at www.fabbag.com just for Rs.599.